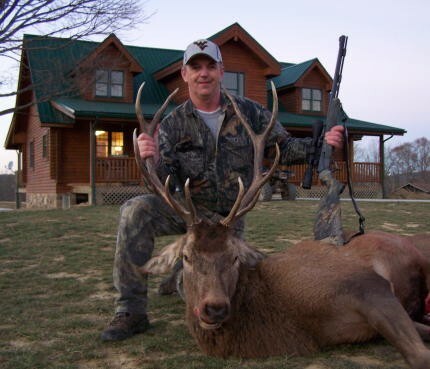 Come and experience the ultimate West Virginia trophy Red Stag deer hunting. We are a HIGH FENCED HUNTING PRESERVE situated on 600 acres of beautiful rolling mountain meadows and hard wood forest. We are located in Monroe County, in, West Virginia. When you are on a stand you will get to see the majestic Red Stag in his natural environment and watch the interaction between the animals. You will marvel at the body size and antler development of our animals…and when the one you want to harvest appears you will have the satisfaction of knowing it will be an animal you will be very pleased to hang in your trophy room. Our hunters can harvest some of nature’s largest Red stag managed at our Preserve. The Red Stag Hunt provides each hunter the opportunity to see numerous mature Red Stag and select the buck that best suits their own personal trophy criteria. You w field with one of our professional guides. We offer a variety of stand locations to put you in range of that elusive trophy Red Stag, including: tree stands, natural ground blinds and enclosed heated blinds. Each hunter will have an experienced guide to assist them with their hunt. This Trophy Whitetail Hunt is sure to be an experience you will remember forever. Our Hunters can harvest some of the largest class trophy whitetails managed at our Preserve. The Trophy Whitetail Hunt provides each hunter the opportunity to see numerous mature trophy whitetails and select the buck that best suits their own personal trophy criteria. You will hunt from one of comfortable blinds you will go to the field with one of our professional guides. Hunters can expect to see an average of 10-20 trophy whitetail bucks per day. When you are on a stand you will get to see the majestic Whitetail in his natural environment and watch the interaction between the animals. You will marvel at the body size and antler development of our animals…and when the one you want to harvest appears you will have the satisfaction of knowing it will be an animal you will be very pleased to hang in your trophy room. We offer a variety of stand locations to put you in range of that elusive trophy whitetail buck, including: tree stands, natural ground blinds and enclosed heated stands. Each hunter will have an experienced guide to assist them with their hunt. This Trophy Whitetail Hunt is sure to be an experience you will remember forever. Trophy Whitetail Prices based on Boone & Crockett Gross Score! Your hog hunt can be booked using your weapon of choice; including bow, handgun, or rifle. You may choose to hunt your trophy hog from ladder stands, box stands or spot and stalk. We have dog hunts available as well. We also have stands and also tree stands set up, so you may have an enjoyable experience, you ma also want to try spot and stalk hunting for your trophy. Either way you choose to hunt these hogs it is a very exciting and adrenaline pumping hunt.